Crisis In the Kremlin is not acknowledged by anyone to be a power; i.e., no one’s heard of this game. It is high time that Crisis In the Kremlin be openly, in the face of the whole world, reviewed. To this end, Steam Shovelers have been assembled in the United States, England and Israel (to be honest, just the latter), and sketched the following review, to be published in the English language. And much like this overwrought reference, it’s not great. Crisis In the Kremlin is a resource-management strategy game, where players take on the role of leader of the USSR in what are potentially its final years. After choosing the year in which your reign will begin, which decides what events you’re likely to deal with, and your party leader, which decides your allegiance within the regime and in turn, effects the sort of policies you’ll be able to enact, you are thrust into state power, tasked with managing Soviet economy and society to the best of your ability. Unfortunately, true to its inspiration in the Stalinist state, the game is an unintuitive, clunky mess. Crisis claims to offer a tutorial, but this amounts to little more than a badly-spaced wall of text which dryly describes the interface, riddled with errors both grammatical and semantic, making an already terrible method of imparting knowledge even more difficult to comprehend. This makes the experience of playing the game for the first time akin to attempting to take a Calculus test after studying solely from the Wikipedia article. This wouldn’t be quite so bad if the game weren’t so inscrutable, even after one managed to cobble together a flimsy idea of the rules from a combination of Google and wildly clicking at everything on screen in the hopes of making something happen. On the face of it, Crisis In the Kremlin really isn’t that complicated: at the start of every turn, you choose how to allocate your budget, maneuver between political factions, dictate broad government policies and decide how to react to specific events. A typical turn may see you split new profits between your main political faction and army generals to retain loyalty, invest in social programs to keep the economy going and the populace supportive, and decide how to deal with a genuine working-class uprising pro-Western reform movement in one of your satellite states. However, the complete lack of audio-visual feedback and general incomprehensibility make these tasks far more arduous than they seem. Take, for example, the task of allocating your budget, which involves entering the amount of money you wish to invest on an old-timey calculator, pressing the “Accept” button on the calculator, and hope that you are not in the “wrong part of the month” where, apparently, you are not allowed to make budget plans – a thing which, far as I can tell, is indicated nowhere in the interface. By the way, “far as I can tell” is a recurring theme in my thoughts on this game, because there are so many details and the tutorial is so long and terrible that it’s hard to tell what you’ve actually been told. Funding is definitely explained in the tutorial – if you call that an explanation – but about other things, I’m not so sure. Take political power points, for example. 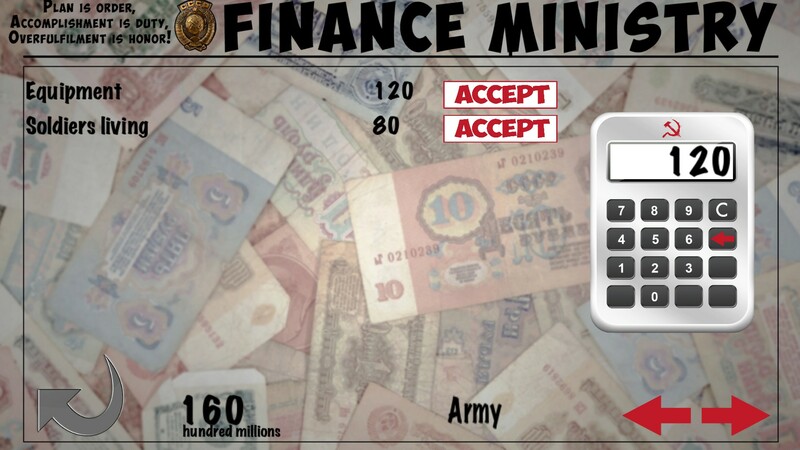 These points are probably the most important element of the game, as they are what you use to open ministries, dictate policies and in general increase your power both domestically and on the international level. For the longest time, though, I had no idea how to gain them. As it turns out, this is done by accomplishing scenarios, short descriptions of an event that then ask you to choose a reaction from a predetermined set of options. 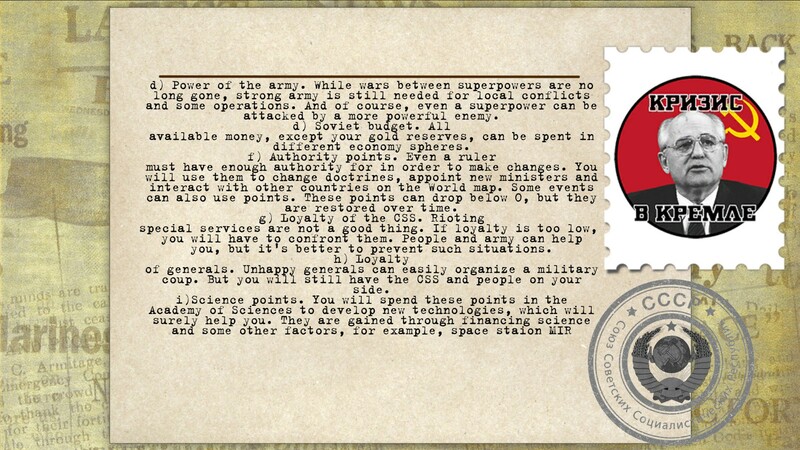 These scenarios are actually pretty interesting, and show a real interest in Soviet history on the part of the developers, limited as the options to react are at times. But keep in mind that this is probably the most important mechanic in the game, and I managed to miss it despite reading the tutorial several times – meaning that if it’s there, it’s certainly not prominent enough. It doesn’t help that the first few scenarios give you no political power points, making it hard to understand that this is the game’s main mechanism of building up resources. There also seems to be no real causal relation between the outcome of a scenario and the political power gained or lost. I’ve seen scenarios that end in an unqualified success that caused the loss of power, and scenarios that ended in unmitigated disaster after which points were gained. If this is due to other actions, such as specific items in the budget being too high or low, the game at no point indicates this in any way. As already mentioned, you can decide to play off certain party factions against each other, but – again, as far as I can tell – this mechanism is utterly broken. You have the power to legalize or ban certain factions, but whatever you do, certain factions just cannot be selected, and there appears to be no connection between the faction you have selected and the one you ended up legalizing or banning. In 1938, Trotsky wrote that “art is an expression of man’s need for an harmonious and complete life… [t]hat is why a protest against reality, either conscious or unconscious, active or passive, optimistic or pessimistic, always forms part of a really creative piece of work. Every new tendency in art has begun with rebellion.” The original Crisis In the Kremlin was released in 1991, in the days of the collapse of the USSR. To many evil and rotten counter-revolutionaries people, these events signalled the ultimate victory of capitalism over socialism and communism, and the developers of the original game seemed to concur; apparently the game was so extreme in portraying the inevitability of free market capitalism that even contemporary reviewer and self-described Reaganite Chuck Moss, in his review for CGW, found it necessary to point out just how much this bias “distorts the game’s veracity”. Nevertheless, at least OG Crisis In the Kremlin had a point to make about real social issues. It was based in, as Trotsky said, a sort-of rebellion, even if it was the unsuccessful rebellion of others who hoped the fall of the USSR would lead to a better Russia. I’m not quite sure what point Crisis In the Kremlin had to make; I suspect it tried to do little more than recreate an old game, and in this lay its failing. To quote Marx, “the beginner who has learned a new language always translates it back into his mother tongue, but he assimilates the spirit of the new language and expresses himself freely in it only when he moves in it without recalling the old and when he forgets his native tongue.” Kremlingames, just to add another quote to the list, seem to have learned nothing and forget nothing. I’ve read a lot of Communist stuff, is what I’m saying. Fittingly, much of it from 30s.